I have recently written a novel involving Robert Louis Stevenson, so was initially drawn to this production merely because of its subject matter, but I soon found myself completely blown away by its sheer sense of style. In Headlock Theatre’s contemporary reworking of Stevenson’s classic tale, Doctor Jekyll is a young scientist working on clinical trials in order to develop a drug to combat depression. He’s spurred on by the fact that his own sister, Marta, suffers from the illness. Impatient to get the drug (C9) onto the market, he volunteers to test out its effects on himself… and quickly starts to go off the rails. This fluid, energetic production utilises speech and physical theatre to tell a familiar story and in so doing, makes it fresh and riveting. Scenes flow effortlessly into one another, as the eight-strong team work superbly together to create all the locations with nothing more than two chairs and one clipboard as props. 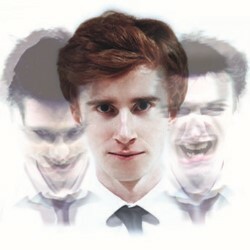 In what is essential an ensemble piece there are of course, two standout roles: Nathan Spencer is a striking Doctor Jekyll while Tom Boxall, as a smirking, twitching Mr Hyde, manages to be absolutely terrifying. It’s always exciting to discover new talent at Edinburgh and Headlock Theatre are surely destined for even greater things. Until then, Jekyll and Hyde is a triumphant calling card that satisfies on just about every level. @philip_caveney Thank you! Great selection of other shows you’ve reviewed too! @philip_caveney thank you so much!